I have very little history with trail shoes. My first introduction to them was the very few that we carried back when I used to work for Fit Right Northwest in Portland, OR (long before being a DPT). 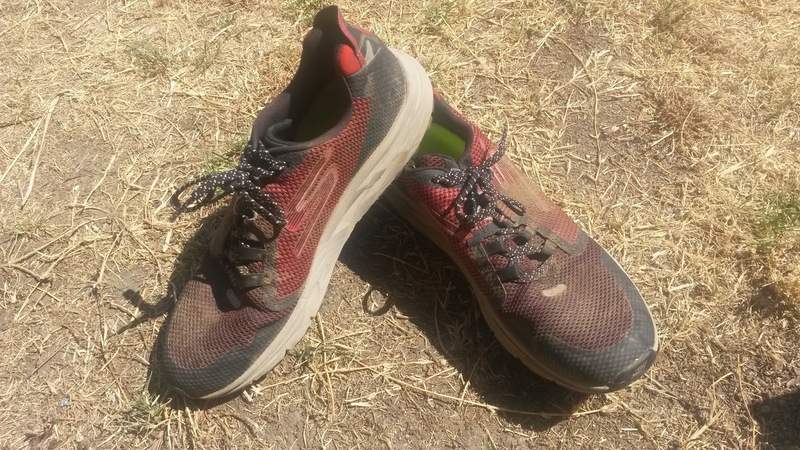 Other than the road shoes that were converted to trail shoes (Brooks Adrenaline ASR and Asics GT trails series being common examples), there were few trail specific shoes at that time. 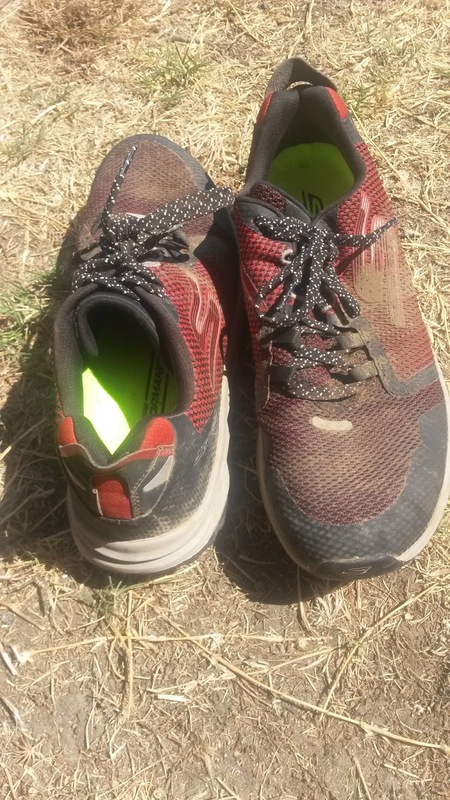 The most notable were the New Balance 101, Minimus 10 and the early Brooks Puregrit from major companies, while Salomon, Montrail, Inov8 and others had the majority of what was at the time a small trail market. That market has now grown an incredible amount to the point that almost every company has either trail shoes or a trail line. As trail racing has become more and more popular, Skechers debuted their first trail specific shoes within the last few years with the GOtrail and GOtrail Ultra series. I did not try either of these previously but was given the opportunity to try the GOtrail 2 which was just released. 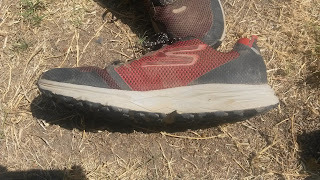 As the lighter and faster of their trail series, I was impressed by the durability and responsiveness of this shoe. This is the first trail shoe that I have had the chance to put through the full paces and thus far I am impressed by the durability and responsiveness. Upon first trying the GOtrail 2 on, I was put off by the thickness of the upper. Currently living in Southern California, our trails are usually not that aggressive and dramatic weather is not usually an issue. As luck would have it, our recent winter earlier this year was very wet and I began to see the true colors of this shoe. The upper is water resistant using what Skechers calls H2GO and GOtherm (everything has to have GO in it...) and I was able to bomb through puddles and rain with little issue. They are not water proof, but do a good jump of keeping the foot relatively dry and warm. When it comes to summer and hot weather running, I have not found any issue with the upper creating an overly warm environment. I typically have not noticed hot uppers, but even with the warmer weather and sun, I have not had any excessive foot sweating. Just know it is thicker and not the most airy. The trade off from what I understand used to be an airy upper in the original is that this upper is durable. After +80 miles I have not seen ANY durability issues despite running some very aggressive and fast trail miles. 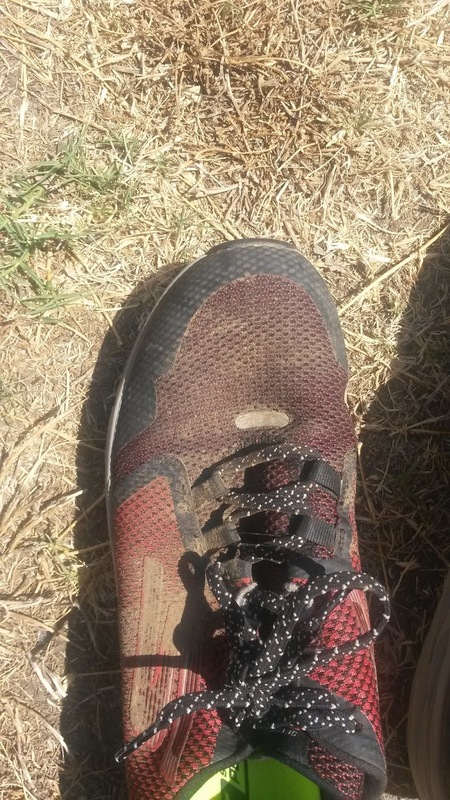 So expect a high number of miles out of this shoe from the upper. There is a heel counter that comes 2/3 of the way up the back, but it is offset by the cushioning around the heel aspect of the upper. 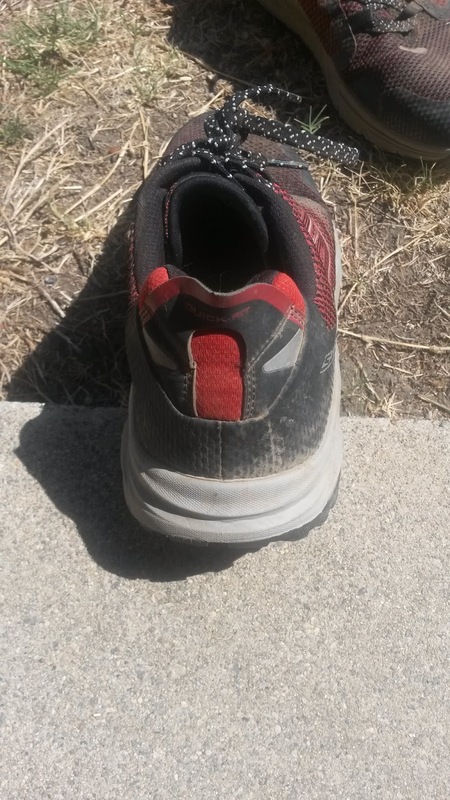 The heel fits fairly well, but I would definitely lace lock the shoe given quick turns that occur on trails. The forefoot is somewhat narrow in the GOtrail 2, so know that you should not expect an Altra-like fit. There is a very light toe-guard that is flexible but do not expect extreme protection from rocks. Speaking of fit, the GOtrail 2 fits a bit narrower and about a 1/4 size long. I believe this is due to the increased thickness of the upper with a little extra length to accommodate foot swelling. Over long trail runs I have not had any rubbing or hot spot issues as the shoe upon 10-20 miles of break in fits very well to the foot. Just be aware that this shoe fits a bit narrower, so those with wider feet may want to check out the GOtrail Ultra. Those with narrow feet will like this shoe. 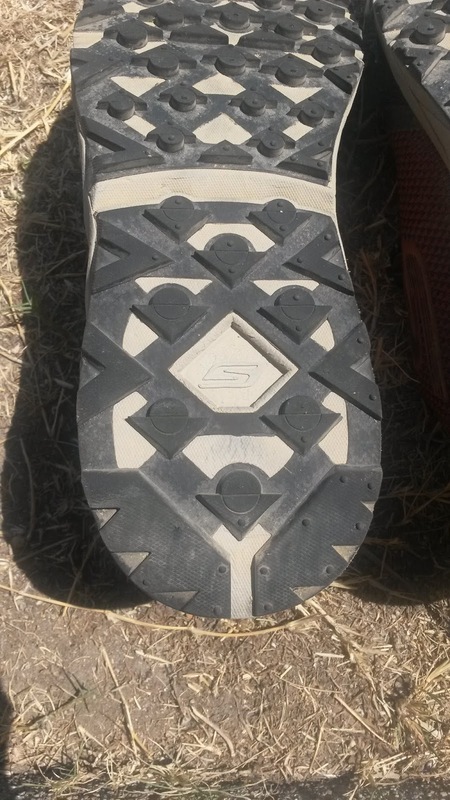 Per Skechers, the sole and ride are supposed to remain the same from version 1. For those that have not tried this shoe before, the GOtrail 2 has a 4mm drop and weighs 9.6 oz (Men's size 9). The cushioning utilized is still 5GEN, which remains decently responsive even after many miles. It is not overly soft or firm, but somewhere in the middle. The GOtrail does have a forefoot Dupont plate, which works somewhat well as a rock plate. However, the sole is very flexible so it actually ends up working as a propulsive plate upon toe-off when the pace picks up. This is not the lightest shoe but it has worked well as a trail tempo shoe for me. I have done a few uphill trail tempo runs (Up to Potato Mountain in Claremont) and it works very well even at higher speeds (despite the 9.6oz weight). There is quite a bit of flexibility in the heel and midfoot, which can wear the body down a bit for those that are a bit unstable, but thanks to the slightly wider bottom, the sole is usually fairly stable across a variety of surfaces. The GOtrail is a little more on the nimble side of trail shoes than the kind that can just bomb over anything. 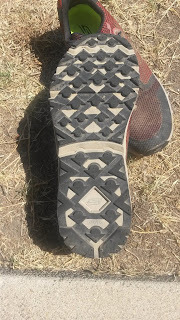 The lugs on the bottom of the sole grip well on a variety of rocks, dirt and light mud. They have been extremely durable over then many miles I have put on this shoe and there has been almost no wear on the outsole (just like the upper). From a grip standpoint I have not had any issues going over wet slippery rocks, but as with most shoes I would still be careful. This shoe really shines best though on soft trails either due to moisture or lots of dirt. Skechers is still utilizing the M-Strike design and the somewhat rockered sole. It is much less extreme than previous shoes but still lends to a smooth ride on the trail. 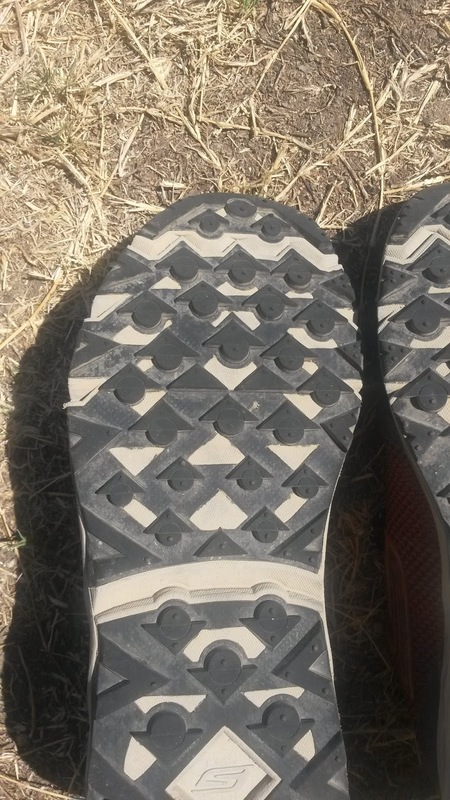 I have a problem with companies continuing to add a significant flex groove in the midfoot. I just discussed this with the Saucony Type A8 (HERE), but again there are no joints that work in the sagittal plane at the midfoot. They all work more in the frontal and transverse planes (although none of them work purely in either of those two planes either). I can understand if this may be an attempt to facilitate sagittal plane motion rather than transverse or frontal plane by guiding the foot in the forward direction. However my concern is that adding a flex point there may place undo stress on the plantar fascia as the shoe either breaks down or for those with sensitive plantar ligaments. Many companies still do this, Asics being the main offender and Adidas being close behind. Adidas at least has begun to move away from these in their traditional trainers, but their road racing shoes still have them. I have had conversations with many biomechanists on this topic and the jury is still out on whether there is a true benefit. So just be aware that is there that although there is not a midfoot shank, there is an additional flex groove there and know that those with sensitive plantar fascia may need to be careful. For those looking for the Skechers Performance feel in a durable but faster trail shoe meant for long races, I would definitely give the GOtrail 2 a look. 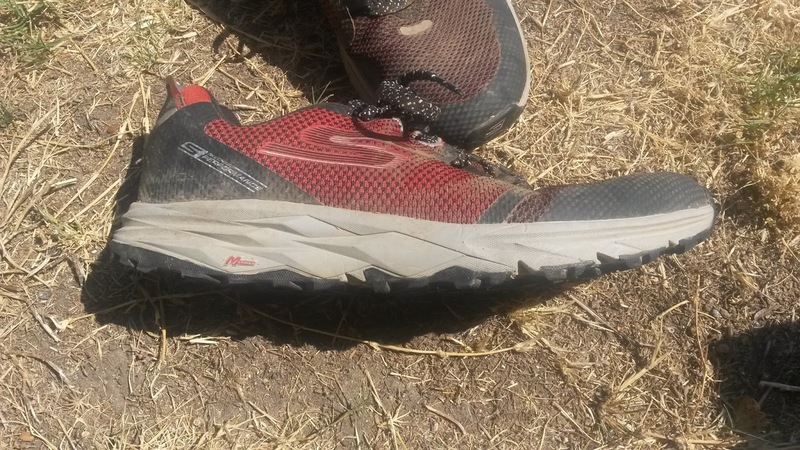 Despite the forefoot plate, the shoe has a good amount of flexibility, so those needing a bit more stable ride may want to look at the GOtrail Ultra 4. For those that are used to the original GOtrail, while this is mainly an upper update, know that it is far more durable, secure and will work far better in wet and muddy environments. 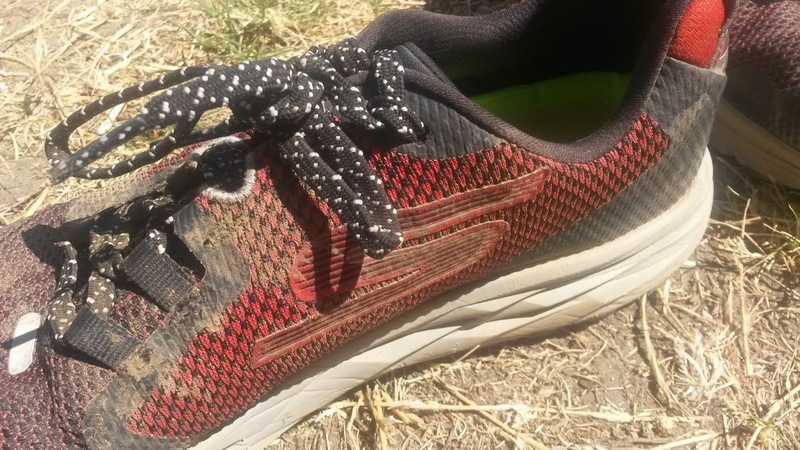 I would definitely take a look a this shoe if you are into trail running or racing. While I still use road shoes for trails, for longer trail only runs on more aggressive terrain these are the first shoes I reach for. ***Disclaimer: These shoes were provided free of charge in exchange for a review. I put at least 75 miles on trainers and 25 miles on racing flats. Currently my pair of GOtrail 2 have 85 miles on them. A big thank you to Skechers Performance for including me in the development of such fantastic trails shoes. The Skechers GOtrail 2 is now available online only at the moment but I hope this and the rest of the Skechers Performance 2017-2018 line convince local running stores to consider carry this brand.